The fact is that I love the look of the four-armed giant green martians from Black Hat and I've been looking to find a way to squeeze them into My Mars somehow. I mean, what could be more typically Martian that a big green creature with four arms? No, I never mentioned Barsoom, not me! But, being a slave to rationality (not to mention one with time on his hands), I needed to have some justification or backstory to have them on my oh-so Chadwickian Mars. The solution came to me when I was tinkering with a couple of ocotosaurs (stop sniggering at the back! ), basically removing the rear pair of spindly legs and converting them into hexosaurs. I think it's quite an improvement for a small investment in time. Just my ha'pennyworth. The said tinkering led me to thinking about the triceratops-like hexosaur which looks like it might worm its way into my collection if I'm not careful. And how the giant martians also have six limbs. And how their mounts have six limbs as well (or they will once I chop the rear ones off like I did with their smaller cousins). Then the thought occurred that this might be a very different branch on the Martian evolutionary tree; one with six-limbed creatures, hexapods if you will, rather than the "normal" four that is seen elsewhere. So far so good, but how had these escaped the notice of Earth explorers and, more importantly, how are they absent from Martian records? Then ideas fell quickly into place, involving some sophisticated selective breeding, experiments that-are-not-permitted-for-a-very-good-reason, rioting mobs, coverups, evil geniuses (genii?) looking for the Ultimate Weapon, and other pulpy goodness in general. I think there might also have been a "bwahahahaha!" in there for good measure. The rapid evolution of hexapods was kickstarted millennia ago, as the seas receded and Canal Martian scientists were looking for a way to improve drought resistance in domesticated animals. Their experiments mostly involved selective breeding of a variety of six-legged rodent-sized creatures that already survived well in arid conditions. Some of their work was very successful indeed, enabling them to breed quite large creatures that could be bred for food or used as beasts of burden and yet still survive extremely dry conditions. In fact the experiments were so successful that some scientists strayed across a line-that-should-not-be-crossed, and attempted cross-breeding between Canal Martian and hexapods. Against all the odds they were successful. How it was achieved is not known - those records were destroyed long ago - but they had succeeded in breeding creatures about the size of a roogie that were fertile and even bred true. The creatures had a bipedal stance, and both pairs of upper limbs had the standard Martian hand (three fingers and a thumb). The upper pair were capable of finer manipulation than the more muscled lower pair. Their intelligence was soon bred and trained to the level of a young child. And there the work stopped. The hubris of the scientists knew no bounds, but the religious establishment determined that abominations had been created. Overnight there was a huge backlash against the scientists. Laboratories and breeding centres were attacked and razed. Anything that moved, whether it had four or six limbs, was killed and thrown into cleansing fires. Records were destroyed. It became a taboo topic. It never happened. Of course not all of the more remote research stations were ever found; stations that became more remote year by year as the waters receded and the lands dried ever more. Some of the breeding stock survived, and even thrived in the dry conditions. They were never huge populations but they were large enough to be self-sustaining and life was challenging enough for the bipedal forms to evolve in size and in intelligence. Then about two Martian centuries ago (that's about 300 Earth years) the Worm Cult came across some strange writings concerning a time of cleansing, and started to look for remnants from that time. For some years there had been tall stories from Hill Martians about large green devils erupting from the desert. Not unnaturally these had been discounted by civilised types, but the hints were suggestive enough for the Worm cultists to locate a couple of tribes and to nurture them, hoping to develop them into a tool to destroy civilisation and return the planet to the chaotic state they craved. And what a tool they have found! By dint of further breeding they developed warriors that now stand over three metres tall, and that can tear a man's head off with their bare hands. They are not rocket scientists, but they certainly aren't stupid either. They are hardened desert warriors, with cunning and a natural gift for combat. When they ride to battle, it is on large aggressive war mounts. They can appear from the deep desert, strike hard and then disappear again as if they never existed. The next step in the appearance of the Giant Martians was when the Worm Cult was able to negotiate agreements (alliances would be too strong a term) with several High Martian clans, and migrated some Giant Martians family groups to live in the rugged canyons of the highlands where they would be difficult for sky navies of civilised states to find. That was the point at which their numbers started to explode - what looks rugged and parched to a Canal Martian is a land of milk and honey to a Giant Martian. This all explains why the Giant Martians have only been a problem for Canal Martian for the last 40-or-so Martian years, since about a generation before the arrival of the Red Men. Any records that still exist are either buried very deep or phrased in such a way as to mean nothing without knowing a lot about the context. And if anyone does know the context, they aren't about to have their dirty racial laundry washed in public - it would again be a matter of great shame to the Canal Martian psyche. Thus the Giant Martians have, in effect, burst out of nowhere, and they are starting to run amok. The Worm Cult now works hard to keep them supplied with weapons, ensuring they cause general mayhem and destruction where they will. High Martians recognise that they can get their Giant Martian neighbours to do a lot of hard fighting for them and will often tag along, providing airborne support (an area where Giant Martians are vulnerable). If the Worm Cult have a specific task in mind for their Giant Martian allies (for they are no longer clients) they will deploy small detachments of their robed cultists to maintain focus. Linguistic footnote - the Parhooni word for a Giant Martian translates as "man-and-a-half", referring both to their height and to the number of limbs. This post has rambled on quite long enough, but I'm quite happy that the general outline will let me add Giant Martians to My Mars without it disrupting the background. In fact I think it makes it a lot richer for the purpose of wargaming, but I'm biased. Comments and improvements always welcome! I like the idea of adding Green martians to the Chadwickian Mars. I game in 25/28mm and picked up some of Tin Man minis Green Martians. 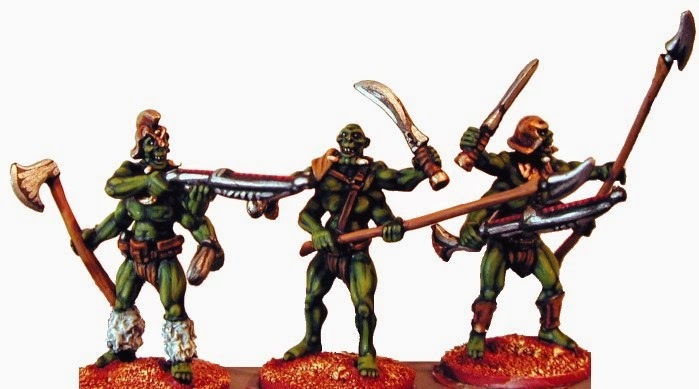 I am also looking at getting a few of the Bronze Age Green martians to use as character models. I wasn't actually going to name the producers - I thought that was just too cruel. But thanks for doing the dirty for me! I have the same ideas...really like this! Well at least I can look forward to good company in the asylum. Interesting and runs alongside the recent spoilers in one of the new books on Venus with bio-engineering . Those naughty Worm priests are up to their tricks again I see ;) Time for them to get a sound thrashing from Her Majesty's Navy methinks ;) Start those gunships and head for those Kraggs or where ever else those rotter's are hiding ! In certain of the original Space 1889 modules are references to an older race having once controlled mars - these could be the tie in. I hadn't actually considered a race of "Old Ones". F-e-e-e-ry interesting Mr Bond. I have actually credited the Canal Martians with genetic engineering via selective breeding elsewhere - they've certainly had long enough to perfect the technique and then let it lapse again, several times over. So it could work. No one could have dreamed we were being scrutinized, as someone with a microscope studies creatures that swarm and multiply in a drop of water. Few men even considered the possibility of life on other planets and yet, across the gulf of space, minds immeasurably superior to ours regarded this Earth with envious eyes, and slowly and surely, they drew their plans against us.